The 120GB HDMI-equipped Xbox 360 Elite has finally gone on sale in the UK, after a long wait. The sleek black console will now head up the Xbox range as the flagship model, priced at £300. Today also sees the recently announced price cuts kick in for the Xbox 360 Premium and Core consoles which will now cost you £250 and £180 respectively. Microsoft is attempting to put some pressure on Nintendo by pricing the Core at the same level as the Wii. It's a bit of a big day for Microsoft. The company also announced that the 20GB Halo 3 Special Edition Xbox 360 will launch on 26 September for the sum of £280. It's basically just a Premium console adorned with a pretty Halo 3 exterior. It does come with HDMI though, so Halo fans with a high-definition TV might sit up and take note. Disappointingly mind you, it doesn't come with a copy of the Halo 3 game and for an extra £20 you can get the Elite with a 120GB hard drive, so some might think it's not quite worth the money. 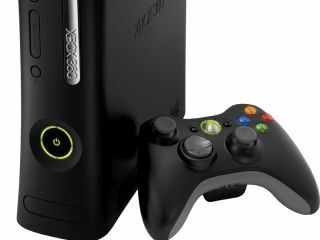 It's also being reported today that a revised model of the Xbox 360, codenamed Falcon, will begin shipping at the end of the summer. It will most likely contain more reliable and efficient 65-nanometre processing chips which should eliminate any overheating problems (current 360s have 90-nanometre parts). These new parts are also cheaper to produce, so there's a good chance that the price of the 360 will come down again at some point. The newest report comes from the Mercury News blog, although Microsoft got in touch with CVG to say that "updating components is common practice within the industry. Microsoft does not comment on these upgrades".